The Ohio River finally gave in to the cold Friday, freezing on its’ surface enough for this gaggle of geese to take a break. 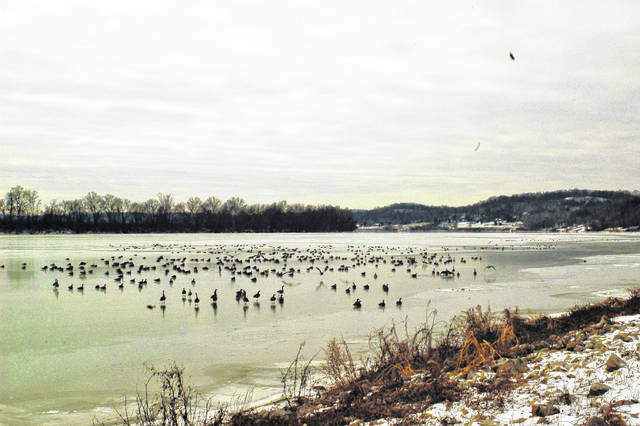 OHIO VALLEY — The tri-county region is experiencing prolonged cold, resulting in the Ohio River freezing in some places. Life and work on the river keeps on even if there is ice covering the surface. According to Mike Zwier, meteorologist with the National Weather Service in Charleston W.Va., the area has had temperatures below the average for more than a week. In order for large bodies of water to freeze, particularly rivers that are constantly flowing, the temperatures have to remain cold enough long enough. Zwier explained looking ahead that the cold will remain until Sunday or Monday when it will finally reach above freezing, with some rain possible as well. With those days warming the ground and air, the snow and ice will recede for the time being. Jack Fowler with the Point Pleasant River Museum and Learning Center remembers when the river froze completely during the 1970’s while he worked at Kaiser Aluminum. The last time the river froze completely and stopped traffic on the river was the winter of 1977, although traffic is still moving on the Ohio currently. “There was a big freeze…it stayed below freezing for 20 some days back then. We ice skated on the river back then,” said Fowler. Cpt. Butch Leport with AEP River Operations knows what it is like working on the river in sub-zero temperatures. As a captain on the river, he explained that the amount of river operations traffic affects the ice, with barges breaking up the ice. “Ice builds from the shoreline out, it’s called anchor ice. Anchor ice is necessary to build then out,” said Leport. The major difficulty that river barges and workers face is the added stress on the equipment and river workers. Leport explained that they pulled some older barges from service while the river is icing over in order to keep them in service. The Army Corps of Engineers operates the Robert C. Byrd Locks and Dam and has to regularly run a “slushing” operation on the locks. They do this through operating the different gates to create a waterfall affect that flushes out the ice.